As you might have seen the media lately, we're very proud to be the recipients of a large funding boost from the DOC Community Conservation Partnerships Fund (CCPF) for this project. We held a small ceremony on site (near the Waiotaka river) where the Hon Minister of Conservation Nick Smith announced the fund and took part in the planting of seven kahikatea trees to syombilise the relationship being forged between Ngati Rongomai, Ngati Hine & Ngati Te Rangiita, Department of Corrections, DOC and ourselves to complete the next stage in this exciting project. The CCPF fund is in addition to the WCEE Trust funding we already receive and will allow for the 'ramping up' of riparian and restoration planting - not only on public conservation land, but on private Maori-owned land within the rohe of the three hapu involved. This planting will be achieved with the help of another local agreement between DOC, ourselves and Tongariro Prison to produce 10,000 plants (grown in the prison's new nursery) which will then be planted in the above mentioned land. Recently, we have also been working on identifying funding sources which will fund the environmental coordinator's role which links us (PT), DOC and the three Hapu. Jeanette Trego has happily accepted this position and her primary role will be to communicate with the private Maori land owners and achieve permission for work to be completed on their land. We are very happy with this development; it strongly signals that the three Hapu not only want to encourage this project but want to be actively involved. We have also been the fortunate recipient of a further fund - the Waikato Regional Council's Small Scale Initiatives Fund. As Shirley mentions in her article below we had two funding applications in for practical support and we are very happy to have been successful on both accounts! The second application was for a scrub bar and other essential items (spare blades, safety gear and maintenance money) to keep the trapping network 'open' around the Waimarino lagoon. It just goes to show, that success breeds success! Help us finish planting one of the first restoration planting sites of this project! Bring the kids, some snacks and your gardening gloves. Whave 300 trees to plant, followed by a BBQ on-site for lunch! This event is weather dependent, so keep an eye on our Facebook page if it's looking uncertain. We will try for the Sunday if we can. It's been quite busy for us this winter. After a successful season of trapping, we de-commissioned the traps and gave our hardy bunch of trap-checkers a bit of a rest. However, spring is upon us sooner than normal, so we're now in the process of cleaning the traps, checking them and starting to re-bait them. Our online calendar has been revived, so if you're keen to get involved, drop Kiri a line and she'll email you the link to the calendar and put you in touch with our trapping coordinator extraordinaires Ardy & Shirley - who will organise you! Other work completed over winter includes our annual rat control. This is done in our core area utilising our 1028 bait stations. This season we were able to use a local contractor - Manaaki Taiao Forest Care - who did a great job. Lugging huge heavy packs uphill and through the bush and taking them on and off at every bait station is not an easy task. We also tasked them with the job of completing bait station maintenance. Our network is now in great shape! We've completed two rounds of baiting and the monitoring we've done since confirms that we've made a dent in the rat population (under 1%), and protected approximately two clutches of native birds. As in previous years, this winter's control has been provided by the wonderful Pharazyn Trust. Paul Green was fortunate to host one of the trustees around Lake Rotopounamu in April/May and during the course of the day, was given assurances that the Trust would like to keep its support in place for years to come. One of our challenges though is to find a funding partner for the Pharazyn Trust. This would ideally be a local business or individual(s) who are intent on seeing our wonderful work continue in this special corner of Tongariro National Park. There is some not-so-nice-news though. We've discovered that five traps have been taken. Rather than be upset, we thought we would take this opportunity to introduce our new BUY A TRAP initiative and offer our wonderful community the chance to directly sponsor one (or more) traps! The first five will replace the stolen traps but we can always put further traps to good use. They cost $79 each and we will sign you into the website which keeps the records of our 'kills' and you can keep an eye on 'your trap' to see what it's catching. We can also arrange a 'visit' with one of our trap checkers if you'd like to see in person the location! If this sounds like you and you'd like more information, don't hesitate to get in contact. We'd be very grateful! After 16 years of being aware of botanist Peter de Lange's observation of yellow mistletoe (Alepis flavida) in 1987 at Rotopounamu, I finally rediscovered it. It has only taken probably a few hundred hours! The cool part was that I was watching a noisy and playful group of six + kaka high in the top of several massive red beech trees. I was feeling a great sense of achievement (as I was looking at direct proof of all of the hard work put in by DOC and Project Tongariro with killing pests here), when I noticed one kaka was hanging around a dense area of foliage 30m+ up in the top of a tree. It was early morning and overcast so all I could see was a silhouette, though I thought it was worth getting closer to confirm. While I was looking, I found numerous Alepis leaves beneath the tree. However, the story doesn’t end there because on the way home I decided to take a different route back to look for more mistletoe and found Alepis leaves under a different host. Given that this area has had a low possum population for over a decade now I suspect Alepis has started to recover. This is fantastic news for the forest. Now I’ll just need to find the other beech mistletoes! 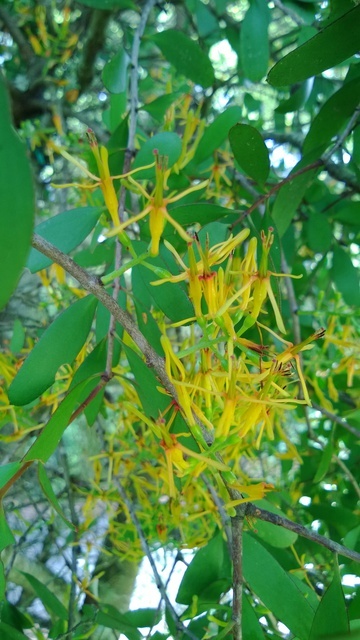 The following images are of the yellow mistletoe so you can keep an eye out while you are walking the Rotopounamu track. Please report any findings! Collette Taylor, a Tauranga-Taupo local and school teacher, is the driving force behind the Hilltop School Weedbusters. Last week they came in their droves to continue their fantastic work in the Oruatua Conservation area. A large weedy patch of predominantly cotoneaster and broom has been transformed over the last couple of years by Collette’s keen crew of hard workers. They hire a bus and bring the school van with trailer. Once the weeds are cut they carry them out to the road and trailer them to the tip. The council has kindly waived the fees for them. Parents come and help and have even paid for the bus hire to keep the work afloat. One of the parents donated $1000 worth of native plants last year. Fortunately most of them survived the drought. The group was given some money from DOC for their hard work and they have put it straight back into the project buy purchasing more tools and another load of native plants that were planted this week. Recently, Ian Jenkins from Tui Lodge also gifted us a collection of natives, with many beautiful kowhai trees that were planted this week by the Hilltop School Weedbusters Group. If you wish to see how you can transform a nasty weedy area, I suggest (for some inspiration) you call in and take a look. In Oruatua Ave the DOC sign marks the track entrance just on the right. Be surprised, and then offer to join in or tackle some weeds in your own neighbourhood! Thanks Waikato Regional Council! Recently we were successful with two bids in the Waikato Regional Council Small Scale Community Initiatives Fund. This fund is designed to support volunteer community-based groups or individuals undertaking animal and plant pest control initiatives in the Waikato region. The principal purpose of the fund is to enable the purchase of materials such as bait stations, traps or herbicides to undertake restoration work within the community. Each application has a maximum of $5000. Our first successful bid (just under $5000) was for the purchase of rat and stoat traps to extend the current trap network in the Oruatua Conservation area (Tauranga-Taupo). This money will buy us 20 more DOC200 traps. The traps are near swampy areas or the river, and will be protecting water birds as well, so we are able to purchase our traps from the Water Fowl Enhancement Trust. This is a win for us as the traps are a bit cheaper than those commercially available and their group benefits too. The traps are made locally at the Tongariro Prison. We have also purchased ten Goodnature self-setting traps to trial. The second bid was for a scrub bar, plus associated parts and safety equipment (under $3000). Anton Bryant from Turangi Chainsaws and Mowers has given Project Tongariro a competitive price for the scrub bar and very generously donated us a Sthil MS 170 chainsaw. These tools are necessary for our fight against weed plants such as cotoneaster, sycamore, hawthorne, broom, blackberry and honeysuckle to name a few. The red dots show existing DOC 200 traps. White dots are our tracking tunnel line. Yellow dots are approximate locations where we will put new DOC 200 traps and the yellow stars are for the A24 traps. New trap locations are approximate and will be worked out to suit water levels around the wetlands and our ability to check traps year round. We have permission for access on the true right for our trap line. The Greening Taupo project is going from strength to strength. The Whakaipo Bay Planting Day was a fantastic event with more than 300 people coming along to help Greening Taupo plant 2,500 trees at Whakaipo Bay on 17 August. The weather was perfect and it was wonderful to see so many children and their families enjoying the event. As well as thanking everyone who turned out on the day, we want to make a special thank you to our partners, the Department of Conservation, the Tindall Foundation, Forest and Bird and of course the Girl Guides, who provide a fabulous barbecue at their camp after the planting. Planting at Whakaipo Bay started in 1988 along the foreshore primarily to prevent erosion and has extended into the gully systems to enhance the environment and create increased food source and shelter for birds. Watch out for next year’s date and be part of the Greening Taupo project. Along with the planting at Whaikapo Bay Nina has been busy working with local schools and DOC on an education project and lining up several other community planting days the most recent of which was held last week at Spa Park in conjuction with Taupo District Council. Another planting day is scheduled for 19th October at Three Mile Bay with Chris Jolly Outdoors. Come along if you are in Taupo on that day! Preparations are currently underway for this year's Mahi Aroha Summer Programme and we are again looking foward to helping DOC host a fantastic calendar of events and activities. Stay tuned for more information on how you can be involved in Mahi Aroha Summer Programme. It’s coming up to that time of the year where we are again on the look-out for much-appreciated people to volunteer as marshals for three events that Project Tongariro provide marshals for. Volunteering for these events benefits Project Tongariro greatly as it’s an excellent way of fundraising and raising awareness of who we are! First off the block is 'The Goat Tongariro Adventure' run on Saturday 6th December 2014. This is a rather brutal (in the nicest possible way) annual running event which has a 20-km event course. The event is incredibly popular with trail runners and adventure seekers all over the country and the capacity field of 600 usually sells out within 24 to 48 hours of the event entries going on sale. This year will be the 11th Goat Tongariro event. Project Tongariro volunteers have traditionally marshalled this event. However unlike previous years, a minimum marshal criteria has been set and interested hardy souls who want to marshall out in the middle of the course need to complete a [brief] application form! BUT, don’t discard this event if that’s not for you. We still need volunteers helping out at the start (marshalling the road and entrance to the round-the-mountain track) and at the finish (final hill on track, the uphill road section, finish line helpers and BBQ cooks). We usually provide a minimum of 16 volunteers. Please email or ring me if interested and I can provide you with further information. The second event is our very own Tussock Traverse which is held on Saturday 24th January 2015. This event has undergone some major changes ‘in the background’ recently. We now have a different event company - Victory Events - who also run The Goat event. We are still firmly the ‘charity partner’ but you will see some changes both in event crew, and the look and feel of the event. We believe the ethos of the Tussock Traverse resonates with many participants who are drawn to it because it offers not only an alpine adventure run / walk in a World Heritage Area, but also offers the opportunity to be involved with an event that gives back to the environment which it is staged in. The course for the Tussock event also follows the round-the-mountain track starting near the Tukino Ski Field, heading north following the track past Waihohonu Hut and the spectacular Tama Lakes, finishing 26km later at Chateau Tongariro in Whakapapa Village. We provide marshals for all 14 marshal points (28 people) plus more volunteers for jobs such as manning the BBQ, drinks tent, bus carparking etc. The third event is the T42 and held on Saturday 2nd May 2015. The T42 event is held on the famous and iconic 42nd Traverse track through Tongariro Forest finishing on the Owhango Domain. It offers participants mountain biking, marathon trail running and adventure trail running or walking. Various distances are offered over three different courses. Project Tongariro traditionally marshall the last leg of the event providing a minimum of eight marshalls. Marshalling at these events requires you to be on the course for approx six hours (usually with one or two other people at your point), providing encouragement and guidance to competitors. At all of these events marshals are well looked after with a in-depth safety briefing and instructions, and a very decent packed lunch followed by a BBQ dinner held in conjunction with the event's prize giving at the end of the day. Volunteering for these events is an exciting and great way to get out into the national park, see areas you normally wouldn't see, meet like-minded people and watch some amazing athletes compete - up close! It also provides you with an interesting way to support us! Volunteer Marshalls for The Goat and the Tussock Traverse are also provided with free ski-lodge-style accommodation for the Friday and Saturday nights over each event weekend. If this is still not enough to encourage you to put your hand up for one or more of these events, Project Tongariro also introduced an initiative last year where every time you volunteer for PT you go into the draw to win a mystery weekend for two. This prize will be drawn at our 'Volunteer Appreciation Dinner' held on Friday 27th February 2015. Helping out at advocacy events such as Kite Day (1st January) and other Mahi Aroha Summer Programme activities and events. Getting involved with 'trap checking' or 'tracking tunnels', bird monitoring etc on one of our restoration projects. Contact Kiri on info@tongariro.org.nz for more information or to express your interest in volunteering. This is an exciting time for us - our successes have brought attention our way and we are proud to host the Director General of DOC - Lou Sanson at our 30th year AGM Celebration dinner on Sat 18th October. We hope you can join us to reflect on our history and help celebrate our successes. If you haven't booked your dinner or accommodation. Please make your booking as soon as you can so that you don't miss out! See you there - we are looking forward to a special evening celebrating with Chateau Tongariro.